112 min. Vivendi Universal Entertainment. Directors: Jiang Wen, Mira Nair, Albert Hughes, Yvan Attal, Brett Ratner, Shekhar Kapur, Natalie Portman, Fatih Akin, Joshua Marston. Cast: Bradley Cooper, Justin Bartha, Andy Garcia, Hayden Christensen, Rachel Bilson, Anton Yelchin, Ethan Hawke, Shia LaBeouf, Natalie Portman, Orlando Bloom, Christina Ricci, Robin Wright Penn, James Caan, Julie Christie, Maggie Q, Drea de Matteo, Rachel Bilson, Blake Lively, Irrfan Khan, John Hurt, Olivia Thirlby, Jacinda Barrett, Chris Cooper, Burt Young, Eli Wallach, Cloris Leachman. Oh, ya gotta love synergy. 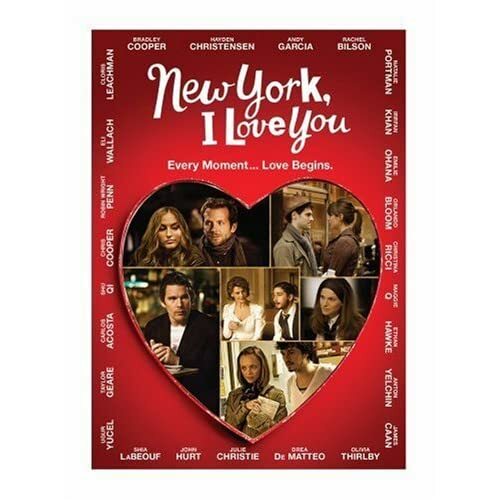 Just as Valentine's Day hits theaters, with a heart-shaped poster design touting its all-star cast (including Bradley Cooper), New York, I Love You hits video with a a heart-shaped cover design touting its all-star cast (including Bradley Cooper). A few may recall the 2007 anthology film Paris, je t’aime, a collage of short films celebrating the City of Lights. Now the same producers have given New York the treatment, and other cities are patiently waiting their turn. Unfortunately, little in New York, I Love You impresses with its dramatic and comedic chops. At least it has a hair more integrity than Valentine's Day, if only in its slightly more convincing urban plurality. Some of the twelve short films are nice enough, some are shaky and a few are outright awful, like the one written by Anthony Minghella, to whom the film is dedicated. Directed by Shekhar Kapur, the segment features Shia LaBeouf as a crippled Russian porter in a symbolic antique hotel. The guy might as well have hung a sign around his neck saying “I AM AN ACTOR! HEAR ME DO A RUSSIAN ACCENT!” He shares the screen with Julie Christie, and indeed New York, I Love You is an all-star affair, with familiar directors behind the camera and familiar faces in front of it. There’s Robin Wright Penn, Maggie Q, Eli Wallach & Cloris Leachman, James Caan, Orlando Bloom, Bradley Cooper, Chris Cooper, Ethan Hawke, Hayden Christensen, Andy Garcia, Irrfan Khan, and Natalie Portman, who acts, writes and directs. The other directors include Mira Nair, Fatih Akin, Brett Ratner, Allen Hughes and Yvan Attal. Nair, Hughes and Attal fare best with segments that have the knack of a short story or tone poem, but the hit to miss ratio of this 110-minute movie isn’t very favorable. The films collectively make it around all five boroughs, though they move more convincingly among upscale characters than working-class or low-class strivers. It's mostly a whole lot of "Meh" (or is it "Feh"?). Hardly any of the films bristle with the thrill of creative discovery, and the stories that do muster some energy get it largely from the performers involved. Penn and Cooper, for example, conduct a mini-master class in acting while going through the paces of an obvious "romantic dinner" scenario. Ditto the compromised pleasure of seeing Wallach and Leachman putter and kvetch their way down New York streets: though I'd watch Wallach, in particular, read the phone book, this script comes uncomfortably close. You know you're in trouble when you're grateful for a Brett Ratner film, his segment being a romantic comedy with a mildly bawdy tone and sly performances from Anton Yelchin, Olivia Thirlby and Caan. The anthology film can be a welcome change of pace, but it works better with longer segments: this short-attention span theater never stays in one place long enough to get any traction. 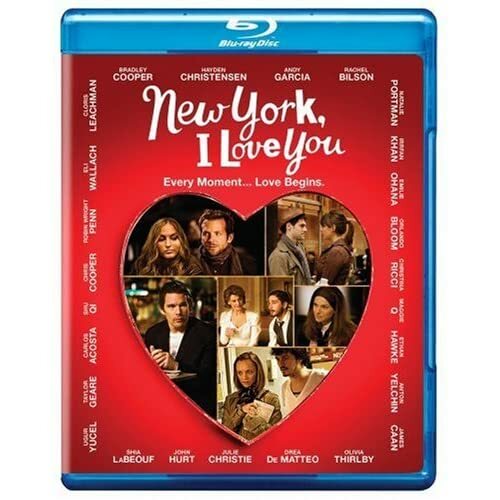 Vivendi does a nice job sending home New York, I Love You on Blu-ray. The image features a great deal of variety, since each director brings his or her unique visual style to each segment. But the picture quality has a nice, film-like consistency, all the same, in ably serving the source material with sharp detail and contrast, true color, and deep black level. The DTS-HD Master Audio 5.1 sound likewise makes the most of the original audio, which sets the New York scene effectively through surround effects and music; thankfully, dialogue always comes through crisply and clearly as well. The extras are slim, but still worthy, beginning with two bonus segments cut from the feature release: "'These Vagabond Shoes' Written and Directed by Scarlett Johansson" (11:43, SD) and "'Apocrypha' Written and Directed by Andrey Zvyagintsev" (13:31, SD). The former features Kevin Bacon, a mostly black-and-white aesthetic, and a score by Philip Glass, but still winds up feeling awkward and empty; the latter--featuring Carla Gugino, Goran Visnjic, Heather Matarazzo, and Nicholas Purcell--is more notable: an evocative short story making good use of NYC locations. "Director Interviews" (16:26 with "Play All" option, HD) include Brett Ratner, Yvan Attal, Josh Marston, Mira Nair and Shunji Iwai. Last up is the "Original Theatrical Trailer" (1:59, HD). All site content © 2000-2019 Peter Canavese. Page generated at 04/17/2019 10:26:49PM.